Sylvania Marina is not just about Caribbean Boats and boat sales. 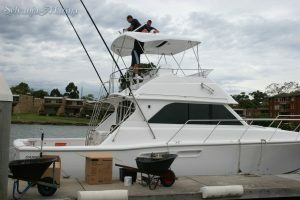 We also cater for just about every boating need. We have a modern 56 berth floating marina, diesel and unleaded fuel, one of the areas only EPA approved slipways that can cater for boats up to 40ft, on site mechanical repairs and servicing, chandlery sales, spare parts, electronic sales including Raymarine and Furuno, insurance repairs and more. Game fishing equipment including game poles, game chairs, rod holders etc.